Scribner Book Company, 9780743269506, 279pp. Edward is nearly four years old when he begins his slow, painful withdrawal from the world. For those who love him -- his father, Jack; his pregnant mother, Rachel; his younger brother, Matt -- the transformation of this happy, intelligent firstborn into a sleepless, feral stranger is a devastating blow, one that will send shockwaves through every nook and cranny of family life. A Wild Ride Up the Cupboards is the story of Edward's descent into autism, and Rachel and Jack's struggle to sustain their marriage under this unanticipated strain. Threaded through the novel, too, is the tale of Rachel's late uncle Mickey, who may have suffered from a similar disorder during a time when society's notions of parenting, pediatrics, and psychology were dramatically different from today's. As Rachel delves into her own family history in search of answers, flashbacks to Mickey's life afford moving insights into both the nature of childhood trauma and the coping mechanisms that families employ. Carefully crafted and deeply entertaining, A Wild Ride Up the Cupboards reveals the author's remarkable gift for language and offers a striking exploration of domestic life that will resonate with readers everywhere. "This is a phenomenal first novel, a story of mother love and ferocity and doggedness, told with delicacy and humor. A writer waits years for a book so true as this, so knowing, so sure-footed. Any parent of an odd and troubled kid will know the shape of the terrain from the first page to the end." "In writing about the passions and sacrifices of motherhood, Ann Bauer has given us a novel that goes deeply and bravely into the heart of one family, showing outsiders what it's like on the inside. A Wild Ride Up the Cupboards is original and astonishing." "Ann Bauer has written a novel of seasons and cycles. They take place within the body of a woman, inside the mind of her child, and during the life of a marriage. The core of the story is a little boy at risk who is composed without a single sentimental note. Ms. Bauer writes him, and her other memorable characters, with courageous precision." "A harrowing story, and an intriguing, disturbing, and moving portrait of a family set loose into wide open and unknown territory." 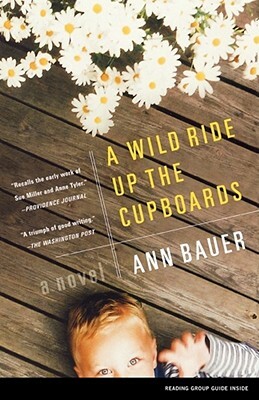 "Ann Bauer has written a beautiful book about a very difficult situation -- a child who is different from the rest. Her voice is sincere and honest, her prose lyric, and her story unforgettable." "A Wild Ride Up the Cupboards brilliantly and entertainingly portrays a family's emotional turbulence and the painful fact that much of a parent's life is fully and completely consumed with the stress and emotional trauma of having an atypical child in our society. Ann Bauer's gift of empathy clearly shines throughout the pages of this novel." "This novel is so good, so strong, so truthful, and every parent who reads it will say, 'Yes, this is how it is.' I read it with my heart in my mouth, and put it down with a sense of real loss."